Hurricane Florence on Wednesday night weakened to a Category 2 storm over the Atlantic with maximum sustained winds of about 175 km per hour, authorities said. 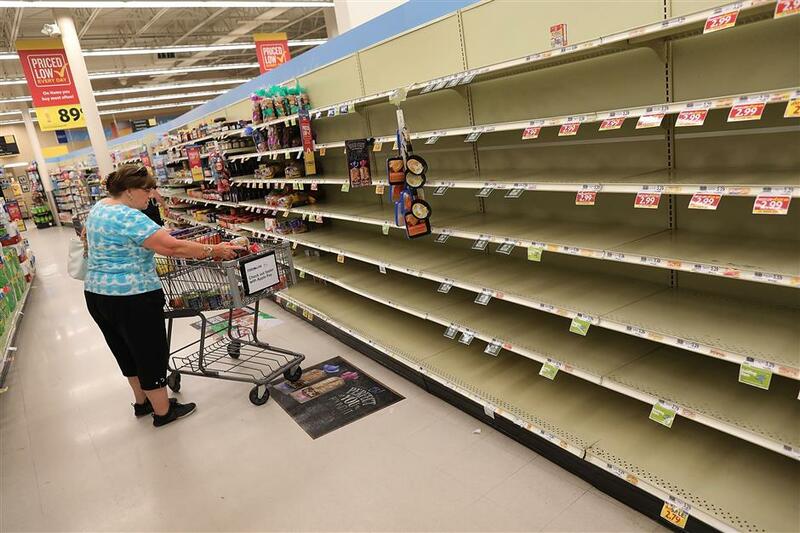 The bread shelves are bare in a grocery store as people stock up on food ahead of the arrival of Hurricane Florence on September 12, 2018, in Myrtle Beach, South Carolina. As a result, Florence is no longer a major hurricane but still regarded as a large, dangerous and life-threatening storm to hammer the states of North Carolina and South Carolina, as well as some other portions along the US East Coast for days. The U.S. National Hurricane Center said Wednesday night that the hurricane's wind field size continues to increase as it approaches the Carolinas. Earlier on Wednesday, North Carolina Governor Roy Cooper said at a press conference that at least 50 shelters are open across the state. Governor of southeastern US state Georgia, Nathan Deal, also declared on Wednesday a state of emergency for the state's all 159 counties after the National Hurricane Center said the storm will turn southwards after reaching North Carolina late Thursday and early Friday. "In light of the storm's forecast southward track after making landfall, I encourage Georgians to be prepared for the inland effects of the storm as well as the ensuing storm surge in coastal areas," said Deal. Governors of South Carolina, North Carolina, Virginia and Maryland have already declared a state of emergency ahead of the storm, joined by Washington DC mayor on Tuesday.